AIM: This article investigates the relative importance of physical capital accumulation and TFP in explaining output growth in 36 sub-Saharan African (SSA) countries over 1996-2014. The possibility of TFP-induced input effects is tested in order to better assess the role of TFP in total output growth. SETTING: 36 SSA countries over the period 1996-2014. The channels for improving economic growth have been the focus of economists and other social scientists for several decades as countries experience marked differences in the development of their productive capacities and in the improvement of their standards of living. While some countries achieve rapid income growth and high standards of living, others cannot assure the subsistence needs of the population. The large cross-country disparity in output growth has been the focus of numerous economic studies interested in explaining economic growth, animating the literature on output growth for more than five decades, and leading to different theoretical and empirical results (Caselli 2005; Hall & Jones 1999). This article takes as its object of analysis the decomposition of output growth in sub-Saharan African countries. Established growth literature attributes output growth to two factors: production inputs and total factor productivity (TFP). While inputs usually refer to physical capital (machinery and equipment) and workers (labour), TFP refers to everything else that affects growth other than physical capital and labour (institutions, policies, technologies, etc.). TFP is at the centre of studies on economic growth and production efficiency. The focus on TFP in many ways goes back to the days of Adam Smith, the founding father of economics, and his theory of specialisation. TFP measures how well inputs are used in production and is a key measure of a country's comparative advantage. Technological innovation, sound economic policies, and quality institutions are all factors that improve the level of output produced per unit of input, and therefore positively impact productivity. In turn, the level of productivity determines the rate of return on investment, setting the base from which profits and wages originate, leading to growth. There is general consensus that productivity is a crucial determinant of, among other things, a country's growth rate, international competitiveness, and the population's well-being (Easterly & Levine 2001; Klenow & Rodriguez-Clare 1997). Even though TFP has been the focus of government and international organisations around the world, the claim that TFP is the main source of growth does not have unanimous empirical support. Quite the contrary is the case. A close look at country level data reveals that physical capital accumulation explains a large part of growth in most regions of the world. See Table 1. 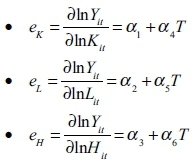 Empirically, the first answers to the question of growth components arrive in the late 1950s when the first growth model (Solow 1956) was tested using growth accounting, a method allowing the assessment of the relative contribution of each component (physical capital, labour, and TFP). Early growth accounting results show that physical capital accumulation explains only a small part of total output growth and that the bulk of growth is attributable to TFP. This result was later found to be robust to alternative functional forms for production and different ways of measuring inputs and output (Caselli 2005). Recent growth accounting studies reject the importance of TFP in growth, and conclude that physical and human capital accumulation explains most output growth (Turner, Tamura & Mulholland 2013). The limitations of growth accounting and the increased availability of panel data sets for developed and developing countries opened the door to models that focus on analysing issues related to efficiency, absorptive capacity, and TFP growth. The debate initiated with the so-called endogenous growth models (Lucas 1988; Romer 1986). These models, which claim that physical and human capital accumulation are important elements of growth, extended to a whole stream of literature comprising various more or less sophisticated techniques and assumptions that assess the relative effect of TFP and technological change in total output growth. Cross-country regression analysis emerged as an extensively used method in the 1990s soon after the emergence of endogenous growth theory (Benhabib & Spiegel 1997; Coe, Helpman & Hoffmaister 1997; Miller & Upadhyay 2000). The method consists of regressing a measure of output growth against a set of variables believed to explain growth and a residual associated with TFP. It presents several advantages as it permits a large variety of production function specifications as well as different assumptions regarding returns to scale, spillover effects, and technological change. The method proves particularly interesting with panel data, which incorporate country-specific effects. As regards the factors driving output growth, cross-country regression analysis seems to favour capital accumulation over TFP. For example, Mankiw, Romer and Weil (1992) conclude that differences in physical and human capital accumulation explain almost 80% of income differences. The major drawback of cross-country regression analysis, however, is the potential endogeneity in the regressors, viz. that one or more explanatory variables can be correlated with the error term, leading to an inconsistent estimation (León-Gonzalez & Montolio 2015). The inconclusive results about the drivers of growth led to the adoption of more sophisticated methodologies that decompose output growth, such as stochastic frontier. Frontier methodology allows the decomposition of output growth into input change, efficiency change, and technological change, and helps to pinpoint which component is relatively more important in determining a country's growth. Early frontier applications to growth confirm that it is capital accumulation rather than TFP that explains the largest share of growth (Koop, Osiewalski & Steel 1999, 2000). Further stochastic frontier studies find similar results (Henderson & Russell 2005; Kumar & Russell 2002; Limam, Miller & Garzarelli 2017; Nissan & Niroomand 2006; Pires & Garcia 2012). The relative importance of physical capital accumulation and TFP in explaining growth is at the heart of the present article. More precisely, the article applies stochastic frontier to a sample of 36 sub-Saharan African (SSA) countries over the period 1996-2014 in order to decompose output growth. This is in the footsteps of studies that using different methodologies examine the relative contributions of inputs and TFP to output growth in SSA. In a cross-country study composed of nine geographic regions, Baier, Dwyer and Tamura (2006) find that TFP is an unimportant part of average output growth across all countries. In addition, the study reports negative TFP growth in central and southern Africa, the region having the lowest contribution of TFP to output growth per worker. Tahari et al. (2004) applies growth accounting to a set of 43 SSA countries individually and in sub-groups. In all cases, growth is found to be primarily driven by factor accumulation with little (or negative) contribution from TFP. Despite these contributions, cross-country studies on the sources of growth in SSA remain limited and, except for a few, they mainly use the growth accounting method. A major limitation of growth accounting resides in the fact that the method associates the residual with TFP with no distinction between efficiency and technological change. By using stochastic frontier, this article introduces another way of decomposing output growth in SSA while accounting for efficiency as well as technological factors. The question of growth decomposition is particularly relevant for SSA as the region has registered impressive gross domestic product (GDP) growth rates in the past two decades. However, the GDP growth has not been accompanied by a gain in productivity (Cazzavillan, Donadelli & Persha 2013). Since the mid 1990s, the economic activity in SSA has more than doubled, resulting in an average yearly GDP growth rate of 4.5%, which places SSA on a comparable level to other developing regions. This performance represents an impressive surge in conditions after the catastrophic economic outcome of what is commonly referred to as Africa's 'lost decade of the 1980s', which left millions living in extreme poverty. This U-turn in economic performance was equally shared by both resource-rich and non-resource- rich African countries. Despite this gain in growth, the region is still lagging behind when it comes to TFP, which shrank by an average of 0.8% over the period 1999-2014 compared to a world average TFP growth of 0.4% (The Conference Board Total Economy Database 2015). The slow growth in productivity is attributable to a number of macroeconomic, institutional and human development factors. Early studies on SSA mention a number of factors related to SSA's low productivity, ranging from poor social and economic institutions, to ethnic fractionalisation, lack of education and political instability (Easterly & Levine 1997). According to The global competitiveness report 2013-2014 (Schwab 2013), a global database that assesses the competitiveness of more than 130 countries worldwide and provides detailed insights into the drivers of their productivity, the region scores very low in the overall competitiveness indicator (out of 30 SSA countries in the Report, 25 are among the lowest 25%). By taking a closer look at the 12 main pillars that compose the index, one cannot but notice that SSA underperforms in key factors that determine a country's efficiency and productivity: health, higher education and training, technological readiness, market size, and business sophistication (see Table 2). According to the same database, only four economies - Mauritius, Namibia, Seychelles, and South Africa - appear in the top half of the overall competitiveness ranking. 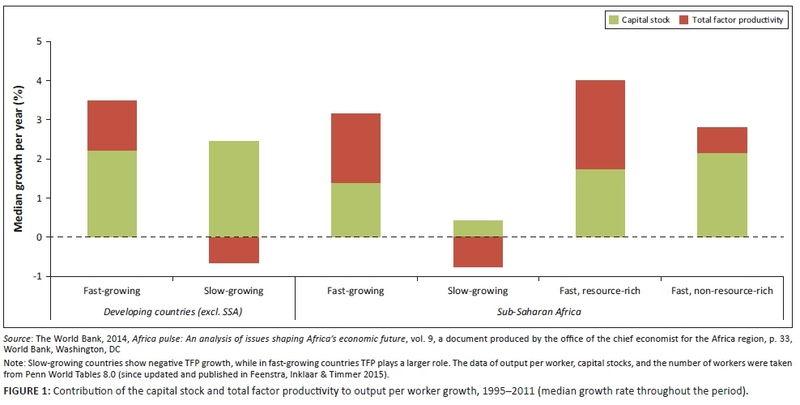 A detailed look at output growth decomposition in SSA and the rest of developing countries excluding SSA (distinguishing between fast-growing and slow-growing SSA countries) shows that except in fast-growing resource-rich countries, Africa's growth appears to be driven by factor accumulation rather than productivity growth. See Figure 1. Identifying the source of growth in SSA is of particular importance for researchers, governments, and national and international development agencies as differences in per capita output have important implications for a host of development indicators, such as income distribution, population happiness, efficient use of available resources, and unemployment. Our results suggest that physical capital accumulation overtakes TFP in explaining growth in 22 out of the 36 countries covered by the analysis. We find that TFP-induced input effects are negligible. Thus, our growth decomposition does not seem to be affected by endogenous impacts of TFP on inputs. Frontier production functions were first introduced by Farell (1957). Two major approaches have been developed since: deterministic, which mainly consists of data envelopment analysis (Charnes, Cooper & Rhodes 1978), and stochastic, which is largely based on econometric analysis (Aigner, Lovell & Schmidt 1977; Meeusen & Van den Broeck 1977). Stochastic frontier uses data of the production units of interest (banks, firms, fisheries, regions, etc.) to estimate a best practice production function based on the best performers of the sample. Each production unit can be producing on or below the production function - namely, on or below the frontier, which is also assumed to be stochastic because it is subject to random external shocks (e.g. coups, earthquakes, wars, weather). The distance between the actual output points and the frontier measures technical inefficiency, entailing that technical efficiency represents how well a production unit converts inputs into output. The intuition is that the closer the unit is to the best practice frontier, the relatively more efficient it is. Hence, efficiency and inefficiency measurements are specular, and we can refer alternatively to one or the other according to context. In essence, a stochastic frontier is an empirically determined economic yardstick for assessing output performance in relation to inputs. Or, to view it differently, frontier benchmarking is about feasibility: efficiency divergences in production units are determined in relation to a yardstick defined by the data and not in ideal terms. In our case, the production units of interest are countries. where Yit equals total output of country i at time t, Xit equals the vector inputs, f(Xit ; b) equals a suitable production function of a vector, Xit, of factor inputs associated with the production of country i at time t, b equals a vector of unknown parameters, ui equals the one-sided error term measuring technical inefficiency of country i, and vit equals a stochastic two-sided error term accounting for statistical error in measurement. The parameter η equals an unknown scalar representing the rate of change of technical inefficiency over time. vit represents independently and identically distributed random errors, , and ui represents non-negative random variables that account for the technical inefficiencies of the sample countries. The ui errors are distributed independently of vit, and follow a normal distribution, that is . Different assumptions have been used regarding the distribution of the one-sided error term u. While the half normal case assumes that the mean of the one-sided error term follows a normal distribution with zero mean, the truncated normal assumes that the mean is truncated and positive. Below, we test both assumptions. To assure that most observations fall below the frontier, we assume that ui > 0. The model allows for technical inefficiency, ui, to increase, remain constant, or decrease over time, when, η > 0, η = 0, or η < 0. Given the use of a simplified translog technology, these elasticities are time specific. We estimate Equation 4 using data from the Penn World Table 9.0 (Feenstra, Inklaar & Timmer 2015). More precisely, Y, K, L and H are respectively proxied by the variables rgdpna, kna, emp, and H from the Penn World Table. where L(H0) and L(H1) are the values of the likelihood function under the null (H0) and alternative (H1) hypotheses. Under the null hypothesis, the test has a χ2 distribution with degrees of freedom equal to the number of restrictions. We test the null hypothesis that the frontier coefficients are jointly insignificant against the alternative hypothesis that at least one of the coefficients is significant. This test means testing γ= μ= 0. 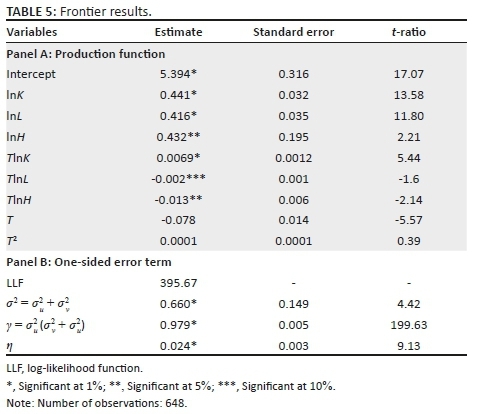 Results show that H0 is strongly rejected, which entails that frontier is a better estimation technique than OLS. The second test checks whether a translog production function fits the data better than a Cobb-Douglas one. We test whether we can reject H0: α4 = α5 = α6 = α7 = α8 = 0. Results allow the rejection of the null hypothesis, which indicates that the translog specification is a better fit than the Cobb-Douglas. Finally, we test for the statistical distribution and the time variance of the one-sided error term. Results show that the one-sided error term follows a half normal distribution and that it is time varying. Table 3 summarises the results of the hypothesis tests. The groundwork to run the stochastic frontier in the panel of 36 sub-Saharan African countries over 1996-2014 is now laid. Appendix 1 lists the countries. Table 4 summarises the results on technical efficiency ranking. Results show that the average technical efficiency for all 36 countries is of the order of 0.45, indicating that, on average, countries in the sample register almost half the efficiency of the most efficient country. Technical efficiency scores vary between a minimum of 16.8% and a maximum of 98%. South Africa and Sudan have the highest rank whereas Liberia and Central African Republic are the lowest. It is not surprising that South Africa numbers among the most efficient in SSA. South Africa is endowed with the best infrastructure and technology among SSA countries. In addition, South Africa's relatively more competitive markets, sound financial system, and abundance of mineral resources make it a very attractive destination for foreign direct investment. During the past decade or so, Sudan has seen wide-ranging structural reforms and sound macroeconomic management, reaching 6% economic growth in 2016. This growth has been largely supported by an increase in foreign direct investment by about 40% over the past decade and stronger political stability. 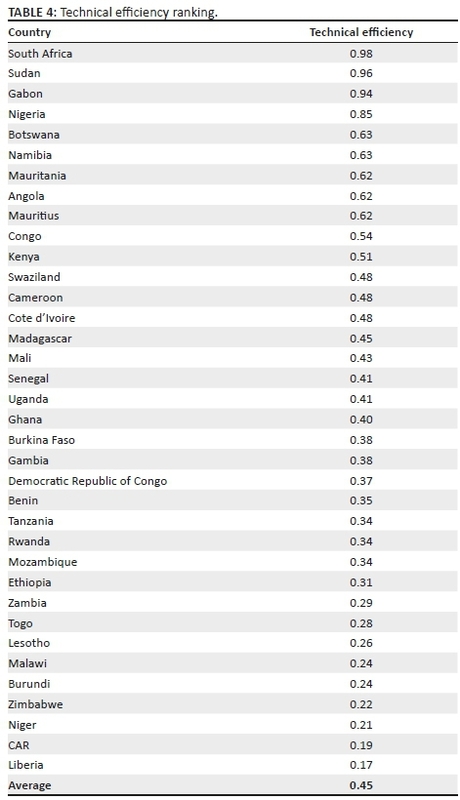 Liberia proving to be the least efficient country comes as no surprise as the country ranks as one of the poorest in the world and its economy is extremely underdeveloped. The country faces numerous economic challenges, including massive international debt, low degree of diversification, poor or nonexistent infrastructure and a low level of human capital. Central African Republic is also one of the poorest countries in the world. A largely rural and destitute population characterises it, with high levels of unemployment and limited infrastructure. Table 5 reports the coefficients of the estimated frontier. The first nine rows exhibit the coefficients of the estimated frontiers whereas the last three rows report the two inefficiency statistics and the log-likelihood function. Notice how the coefficients of the stochastic frontier are consistent with expectations. The coefficients of lnK, lnL and lnH are all positive and significant implying that physical capital, labour and human capital all contribute positively to output growth. The coefficients on T and T2 are not significant however. Only when interacted with lnK does technological change become highly significant, indicating that technology interacts with physical capital to generate output growth - that is, technological change is capital augmenting. Technological change does not significantly interact with labour or human capital. One explanation could be that in this sample of countries the available labour force and the level of human capital do not allow the absorption and adoption of imported technology for the generation of additional output. For example, the level of human capital might not be up to the standard required for technology to affect growth. Perhaps the most controversial question in mainstream growth theory is whether it is factor accumulation or TFP that contributes to the larger fraction of growth. Solow (1956) argues that it is TFP (determined as a residual component to growth after accounting for factors of production) and not factor accumulation that accounts for the bulk of output growth in the US. Easterly and Levine (2001) also find that the residual accounts for most of the income and growth differences across countries. To evaluate the role of TFP in growth, we calculate the share of TFP growth in total output growth. Jorgensen and Griliches (1967) calculate the rate of growth of TFP as the difference between the rate of change of real product and the rate of growth of inputs. Applying this definition to our model, the contribution of TFP to growth is obtained as the residual after removing physical and human capital and labour contributions from total growth. Change in TFP is calculated as follows: , where a dot over a variable indicates the rate of change of the variable over time. Table 6 decomposes output growth per country. Results show that, on average, physical capital accumulation exceeds TFP growth (out of the 36 countries, only 14 countries register a higher share of TFP in growth). A closer look at single country decomposition indicates that performance is not independent from a country's achievements in terms of TFP and physical and human capital accumulation. Table 6 shows that Gabon is the country that registered the lowest output growth over the period and it is also the country with the lowest growth of TFP (the contribution of TFP to total growth is negative). At the same time, Sudan is the country that registered the highest growth and it is also the country with the highest accumulation of physical and human capital. 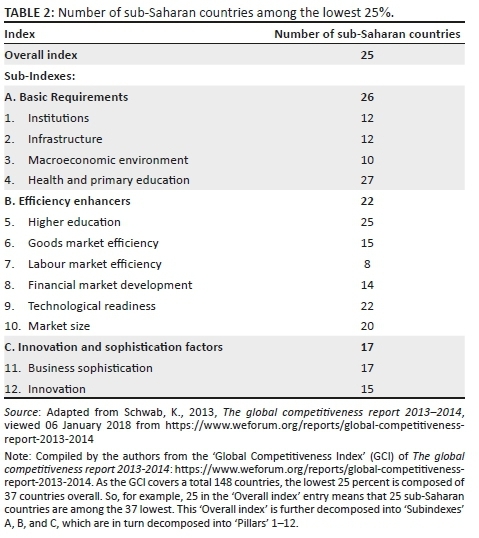 We also note that Mauritius, Namibia, and South Africa list among the 10 most efficient countries, a result that accords with The global competitiveness report 2013-2014 (Schwab 2013). Klenow and Rodriguez-Clare (1997) argue that one has to be careful when decomposing output growth because decisions to invest in physical and human capital are themselves likely to depend on TFP growth, and that a simple growth decomposition may ignore the portion of growth in inputs induced by productivity growth. One should therefore make sure that there is no endogeneity in the inputs used for production. In case the inputs are endogenous, the TFP-induced increase in inputs should be attributed to TFP growth and not to input growth. Klenow and Rodriguez-Clare (1997) reduce the contribution of capital to output growth by limiting capital's contribution to variation in the capital-output ratio (which automatically increases the role of TFP). Applying a variance decomposition approach, they find that the share of TFP in total growth in South Korea increases from 18% to 80% after accounting for the endogenous effects. Variance decomposition however requires a growth accounting framework and is not genuinely compatible with our stochastic frontier approach. In order to give a more accurate picture of the role of TFP in our growth decomposition exercise and to detect TFP-induced input effects, we investigate whether there is a possible long-run relationship between the growth of TFP (TFPg) and the growth of both inputs (Kg and Hg). To the best of our knowledge, the question of a possible TFP-induced input effect (endogeneity) has not been investigated outside of a growth accounting framework. Our article therefore represents a first attempt to investigate such effect in stochastic frontier. In the presence of a TFP-induced effect to either Kgor Hg (or both) the share of TFP growth displayed in Table 6 will be underestimated and will have to be adjusted by the unaccounted effect of TFP on inputs. One procedure is to estimate two separate ordinary least squares (OLS) regressions where TFPg is the dependent variable and Kg and Hg alternate as explanatory variables. However, this procedure requires that the variables of interest be stationary in level. If the variables are not stationary in level, then the OLS estimation is spurious and the t-statistics not reliable, in which case dynamic OLS (DOLS) or fully modified OLS are more appropriate. We therefore examine the time series properties of TFPg, Kg and Hg. The Levin-Lin-Chu (LLC), Hadri, Fisher, Harris-Tzavalis (HT), and Im-Pesaran-Shin (IPS) unit root tests are performed in level and in first difference for the three variables in order to determine their order of integration. Table 7 summarises the results. LLC is the only test that shows stationarity in level for all three variables while TFPg is the only variable that shows stationarity in level in four out of the five tests. All variables are stationary in first difference. We can consequently generalise these results and conclude that the variables are not stationary in level, but stationary in first difference - or integrated of order one I(1) - which invalidates the OLS procedure. The fact that the variables are I (1) means that they can still be related by a stationary linear combination in which case they are said to be cointegrated. 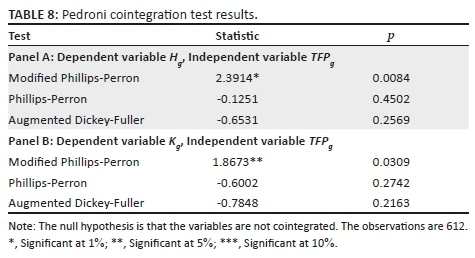 We expect Kg and Hg to be strongly cointegrated with TFPg if there is an induced (endogenous) effect from TFP to K and H. The Pedroni cointegration test is performed and results are displayed in Table 8. Results indicate that Kg and Hg are not cointegrated with TFPg This result is further confirmed with a DOLS estimation where the coefficient of long-run relationship is found to be non-significant (see Table 9). Based on the cointegration tests and the DOLS coefficients, we can conclude that the effect of TFP growth on growth of inputs is very minor and that our stochastic frontier results do not seem to be affected by endogeneity. This article presents a decomposition of output growth in 36 sub-Saharan countries over the period 1996-2014. 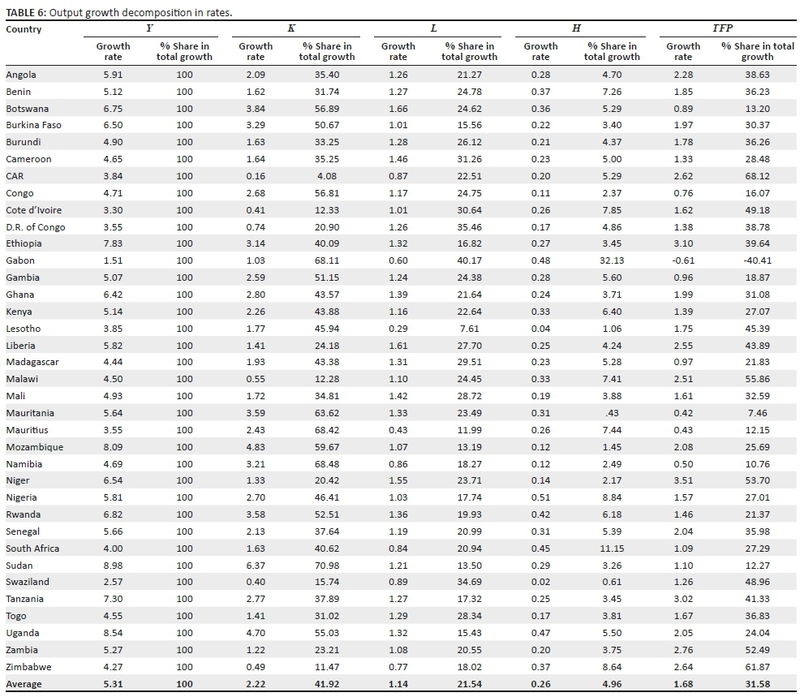 The results show that, on average, real GDP growth in the region over the period is driven primarily by physical capital accumulation (in the total 36 countries, only 14 list TFP as the main driver of growth). TFP growth is the second main component, while labour growth and human capital accumulation are the least important factors of growth. This result leads to the following recommendation: for growth in SSA to be sustainable, countries ought to invest in productivity enhancing factors, such as education, health, and technology. Special thanks to Qaqambile Mathentamo for research assistance.